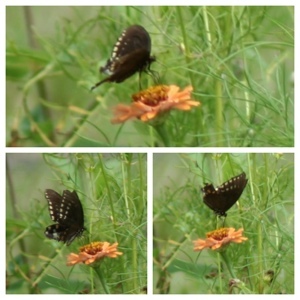 As a child I loved chasing butterflies from flower to flower, I suppose chasing was putting it lightly. Stalking was more like it. Those poor traumatized butterflies. I remember one day being very very young and playing with one of our butterflies until nearly all the dust was off his wings. I was so very sad the he could not fly. He tried but just walked around. I just knew we had killed him, as I looked at his wing dust on our little fingers. We thought and thought what we should do. I had a brilliant idea. Our dirt was dusty like the dust on his wings, so I dusted his wings really good, and said a little prayer, and you know what? He flew, it took him a couple of times, but he flew away. I have always wondered if it was the dirt dust or Heavenly Father answering the prayers of a child who had tender growing faith. My photographs are of butterflies. 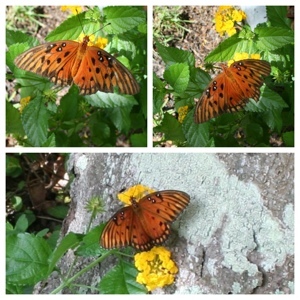 I noticed the wings of the orange butterflies are kind of worn. I wonder if they too have been stalked, captured, and then became a child’s miracle too.